If Lois and Clark were on dirtbikes, the Shoei VFX-W Helmet is probably the helmet that they would be wearing. It is made for kicking up dust in the woods, dirt roads, and open fields of the world. Lightweight, well-ventilated, and extremely comfortable, it is one of the very best. 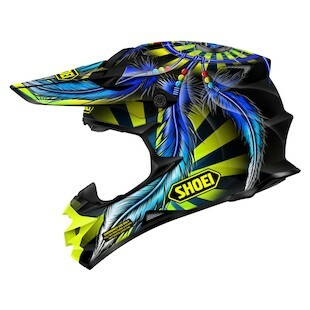 The Shoei VFX-W Grant 2 Helmet is a new graphic in the lineup that features a trippy dreamcatcher theme and vibrant undertone. Stretched out from the top of the helmet the dreamcatcher reaches to every corner of the lid giving it a very encompassing feel. Underneath the feathers and weave is an alternating Yellow/Black or Blue/Black pattern that gives the graphic a good sense of depth. 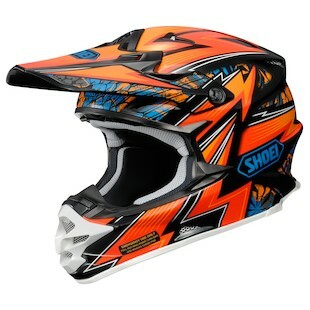 With a very traditional off-road graphic, the Shoei VFX-W Block Pass Helmet is just an absolute mesh of line, color, and angles. With either a Black/White/Silver, Blue/White/Black, or Red, White, Yellow color option, it has multiple options for a variety of riding styles. Like something out of an old Ninja Turtles cartoon, the Shoei VFX-W Maelstrom Helmet is a fun graphic with a graffiti inspired feel throughout. From the lively colors to the alternation of thick/thin lines and faded transitions of contrasting elements, this helmet is one that instantly draws attention in all directions. 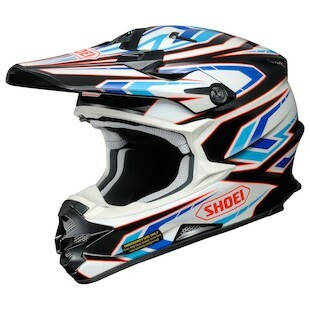 So go out, explore a bit, do it fast, and wear one of the Shoei VFX-W graphical helmets when you do.